Who Is Responsible For Torture? 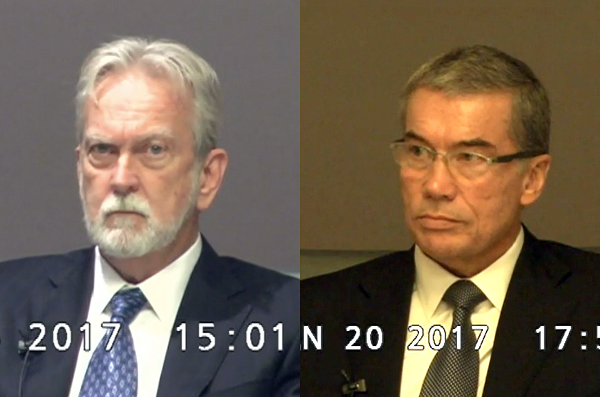 These undated still photos from trial deposition video, accepted as evidence in court and provided by the American Civil Liberties Union, shows psychologists James Mitchell, left, and John Jessen, defendants in a landmark lawsuit that the ACLU filed against the creators of the CIA's harsh interrogation program used in the war on terror. A settlement was reached Thursday, Aug. 17, 2017. Terms of the deal were not disclosed. A settlement was reached last week in a lawsuit against two psychologists who were paid by the CIA to develop its post-9/11 interrogation program. Host Frank Stasio talks with Deborah Weissman, Reef C. Ivey II Distinguished Professor of Law at UNC-Chapel Hill, and Stephen Soldz, clinical psychologist, professor and director of the master's program in social justice and human rights at the Boston Graduate School of Psychoanalysis about torture and accountability. Bruce Jessen and James Mitchell received more than $80 million as contractors, and their work included proposing techniques such as waterboarding and forcing individuals to hold painful positions for hours. The terms of the settlement are confidential, but some psychologists and civil rights attorneys are calling it a “historic victory.” They argue that it is one of the first times individuals affiliated with the torture program are being held accountable. The lawsuit draws attention to ongoing questions about how to compensate torture survivors. Host Frank Stasio talks with Deborah Weissman, Reef C. Ivey II Distinguished Professor of Law at UNC-Chapel Hill, and Stephen Soldz, clinical psychologist, professor and director of the master's program in social justice and human rights at the Boston Graduate School of Psychoanalysis.